It's been far to long since I've done anything for myself (or had the time) and even longer since I've participated in the wonderful practice of Illustration Friday! So very quickly, here is my piece for this weeks "Swamp"
AAAAAAAAnnnd, here is a video of the process of me creating it from start to finish! Thanks for sticking around. I'll be updating what I've been working on for the last 4 months soon. I can't say much yet, but it's 2 picture books!!! 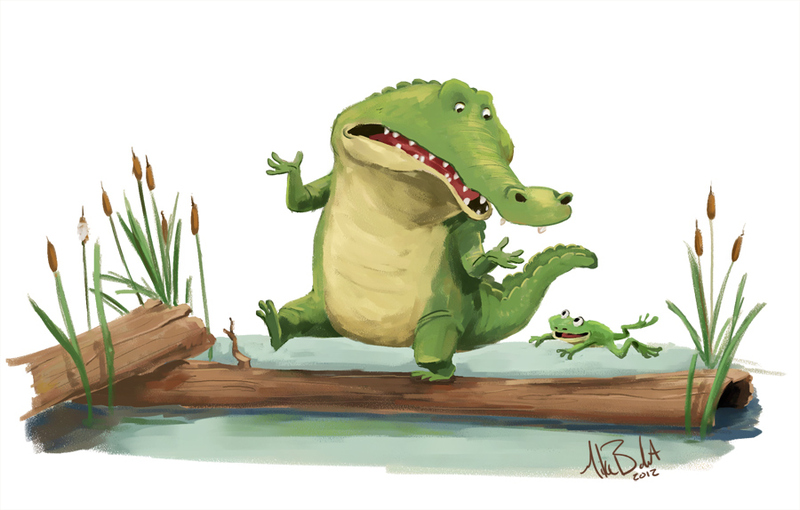 Swamped. That's how I'm defining my last 2 months, and from the looks of things, I'll be doing the same until at least March. I've just recently wrapped up the Alberta Winter Games comic (so expect a post on that...well at some point), and I'm now working on a couple picture books, one of which I've also written. A few months ago, I was contacted by Chirp Magazine and asked if I could write and illustrate a short story for their Neighbours issue (for this November). Of course I agreed. I've always loved Owl magazines and Chirp is actually something my kids already had a subscription to and just love! It was pretty wide open for me as far as the story went. They basically just asked for a rural themed neighbourhood/community short (they had seen my Gophers in Farmer Burrows' Field book). That was right up my alley. So I started brainstorming. Immediately I came to the idea of Chickens. I don't know why, but birds strike me as very community orientated creatures, and I think that friends of ours recently started raising them probably had an influence on me. Anyway, after the editor at Chirp (who was great to work with) agreed and we figured out the final story and script, it was the art work time. (I'd show you the text process if there was actually something to show). As with all my work, my roughs are pretty rough. I just scribble basic positions that I want. Because I only had a total of 4 pages (two spreads) to work with I knew this would be tricky. I wanted to do a nice splash page for the first one, and then spots for the rest that the text could flow around. So because November's issue is now out, Chirp also did a fun little interview with me on their blog, you can see it by clicking here. The whole experience was great, plus it's always cool when your son and daughter can see what you do when it makes it to the "real world"! 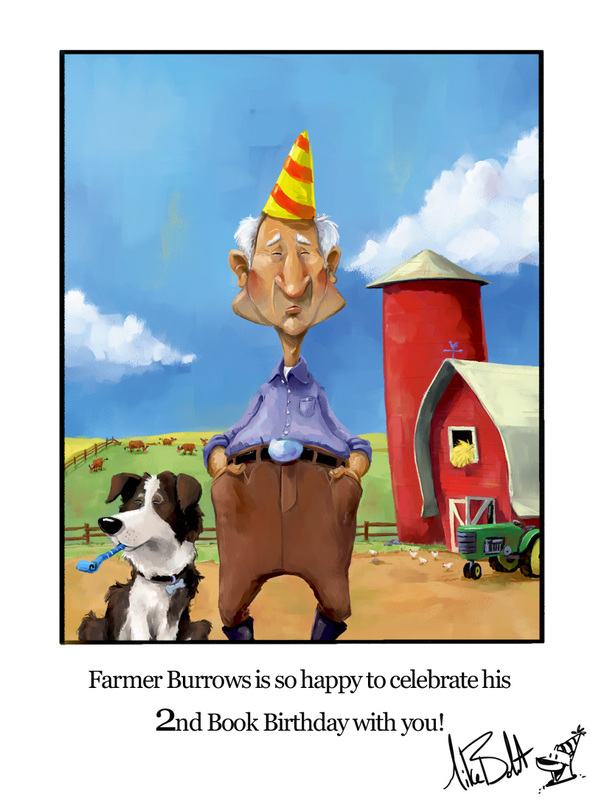 Happy Book Birthday Farmer Burrows! I can't believe it's already been two years since my first book, The Gophers in Farmer Burrows' Field came out! It has been such an amazing experience. For some reason, the first year of the book just blew past me and after I looked back at the fact that I missed celebrating the book turning one, I made a mental note I would not forget again (or at least try not to). Why worry about a book birthday? Though I've been drawing professionally for about 12 years now, I sort of mark the start of my journey into the picture book world from this book. I remember the moment I carried all these boxes into my home, opened them up and held the first copy in my hands. It was a very exciting and proud moment in my life. And yet it was not very long afterwards when I realized it's not about me. This book has brought me into a number of schools over the past 2 years. Minutes into my first presentation I got it. As an author and illustrator I want more than anything, to inspire creativity and imagination in these kids. I don't know who said it (as I'm sure someone did), but two quotes I often write in the front of books I sign are: "Run after your dreams" and "Your life is a book worth reading". I truly believe in these quotes. I would not be doing this as a career if my own parents had not encouraged me the way they did to chase my own dreams in life. Every child out there has a story to tell with their life, and each one is worth "reading". I also see it in my own children. As a father of 3, my wife and I enjoy seeing our kids growing up, developing their personalities and abilities that make them unique. Children are the future and I want to do my best to make them laugh, dream, think, be inspired, and enjoy being a kid, the same way books did that for me. This is my copy of The Gophers in Farmer Burrows' Field. It has a rather embarrassing drawing I did in it, but as soon as I wrote that first school visit in it, I knew this copy had to be the one I brought with me to every school. 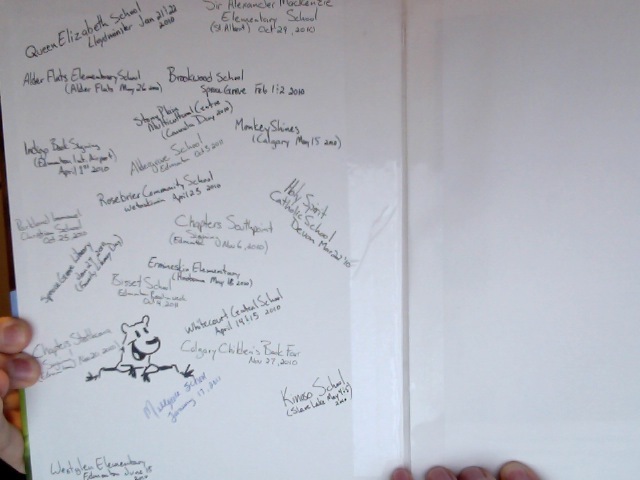 It's getting pretty beat up, but it's special to me and I love opening it up, reading it to the kids, and writing another school's name in it. To celebrate this Farmer Burrows Day I want to make a special offer. Until the end of the month, for every copy of The Gophers in Farmer Burrows' Field that sells, I would LOVE to DONATE a free copy to a school of the buyers choice. I know there are a few people who already have a copy of my book, and so if they want to still celebrate this, I will donate a free copy of the book to a school for ANY and EVERY item that is sold in my store until the end of the month! (the book is available elsewhere, but I can only track sales on my own store to do this unfortunately. So send me a little message with your purchase with the school's info and I'll make sure it gets there! Also, The Gophers in Farmer Burrows' Field is at a 25% OFF discounted price for the remainder of the month! Happy 2nd Book Birthday Farmer Burrows! Hey everyone! I was at a fantastic launch party over the weekend for the 2012 Alberta Winter Games! We were treated to a music by the talented The Bird Sang Song, as well as Juno nominated John Wort Hannam, who was not only hilarious and a great performer, but also wrote the theme song to the games! I was invited to this VIP party/concert because I've been asked to write and illustrate a limited edition comic for it! It will highlight each of the events of the games as well as give a little info and history where I can fit it in. 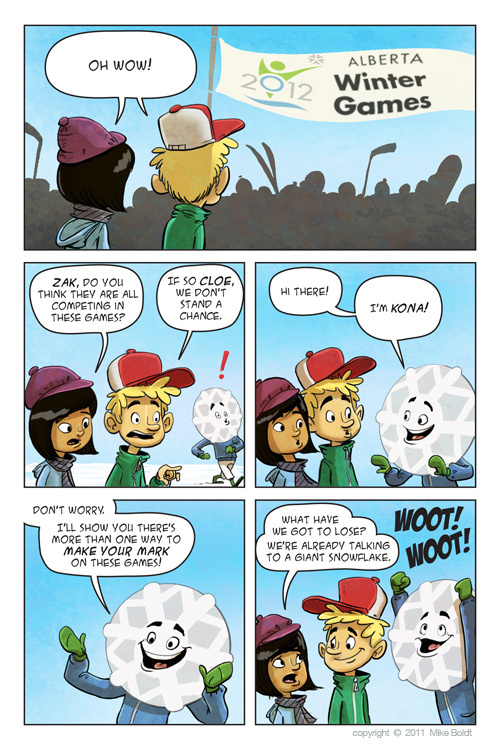 It's going to feature three characters, one of which is Kona, the official mascot of the games. I'll admit it was harder to write than I thought it was going to be, but I'm happy with the result and now I am busy finishing all the artwork. I'm going to be sharing a number of the pages over the next few months before the games launch in February, as well as some process stuff. So stay tuned for more! Hey-Low everyone! Well I've just recently returned from what is probably my last con for the year at the Toronto Fan Expo (or Fan Expo Canada). What an amazing event! The Fan Expo team really knocked it out of the park, in fact 99% of the people I talked to said it was way better from the year before, and it really was. I sold all the Gophers in Farmer Burrows' Field Books that I brought, and sold OUT of my new sketchbook, The Good, the Bad and the Sketchbook Vol.2 as well as a number of my prints! This year I split an end table with my super talented friend Keith Grachow! Keith was selling his classic monster poster prints like hotcakes all weekend long. I was even fortunate enough to snag a Creature from the Black Lagoon print! Go check his stuff out! 1. In this giant's shadow is where I spent most of my days while at the con. Next year I'll get the dinner at the top methinks! 2. My pal Keith running from what I can only guess is Vader about to bust through the door. 5. Some of the commission sketches I did over the weekend - did my first Totoro, Final Fintasy character, Cloak and Dagger, boy as a samurai and...well pretty much the only one I've ever done before was Spidey. 6. And of course, the amazing costumes were everywhere. DJ Trooper, Steam Punk Buzz (with pop-out wings action!!! ), and my favorite, Mario riding Yoshi. San Diego Comic Con took place in July and for the 3rd year in a row, I went. It was of course, a visual onslaught of the entertainment monster, and a lot of fun. It may be my last year attending unless I can get a booth though. Hanging out with great friends was actually my highlight. I picked up a number of really great books too. Cory Godbey has become a really great friend and he set me up with his "Hidden People" book. A MUST, if you like to enjoy what your eyes see. Go buy it NOW. I was also able to briefly hang out with the my pal, Jake Parker, who gave me an advanced "viewing" of his new picture book that he illustrated AWESOME MAN! It was awesome. My picture book pals James Burks, Kyle Neswald and Dan Santat were also there in fine form as well as the Houghton Bros Shane and Chris of REED GUNTHER fame. Also was able to hang out with DJ Welch, Mike Henry and his wife Laura (and a number other friends and groupies of Zatransis). 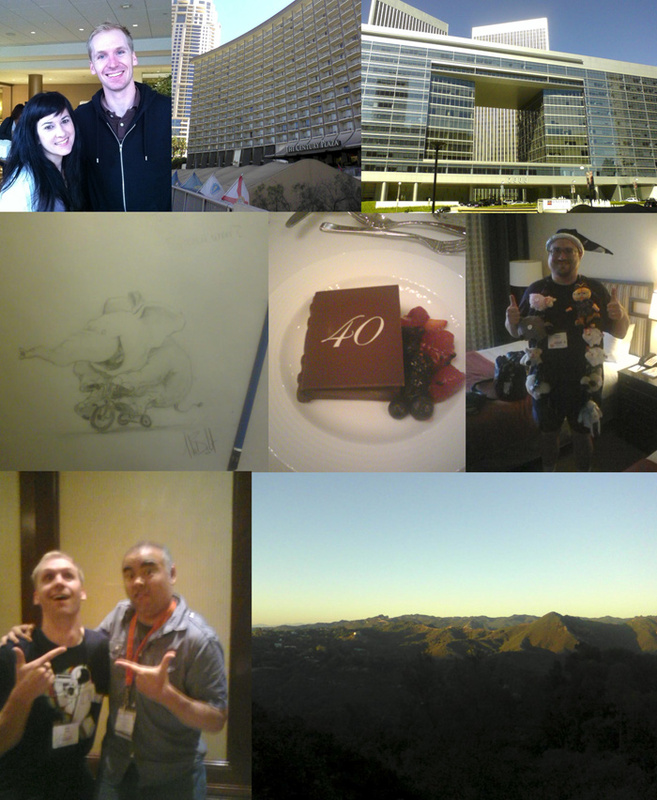 The next thing on my visit list was the SCBWI LA conference. In case you don't know, SCBWI stands for The Society of Children's Book Writers and Illustrators. It was the the 40th anniversary and my first time! It was spectacular. The keynotes were amazing and I learned so much from the sessions. More than all of that I came to truly appreciate the opportunities that have been placed before me. I really love what I do. One of the real bonus's was meeting all the other great people in the children's lit world. Dan Santat and James Burks were there again, as was Bob Boyle, another member of what I am calling the LA Picture Book Brotherhood AKA the LAPBB. I also made some really great new friends, like Barry Wolverton, Lauren Strasnick, Shannon Messenger, Kelly Sonnack, Mary Peterson, Catherine Meyer, Jen and Ryan Bosworth, Richard Watson, Jonathan Schkade, Martha Rago, Angela and Caz of Australia, and so many others. Also what was really great was that I finally got to meet my amazing agent Jen Rofé in person for the first time! The final night was a highlight and perfect ending as Jen set up a small BBQ with a number of her agency's clients overlooking the Topanga Canyon. Eric Elfman and his wife Jan were spectacular hosts (and chefs!). I cannot wait for the next SCBWI convention! This final image is almost necessary as I DO do art for a living - most days. 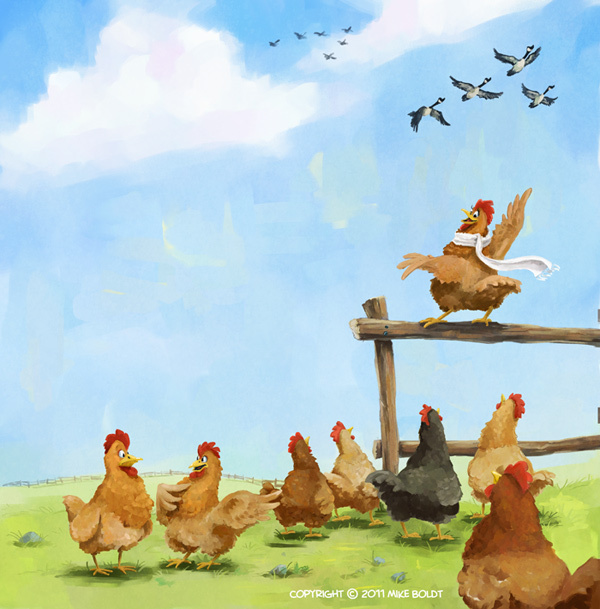 Actually, it's a sneak peek from a story I wrote and illustrated for Chirp Magazine coming out this November. Was a lot of fun and I'll share the rest with you in a few months. I at this point I feel I must throw out how incredible my wife is. While I've been all over and working like crazy this summer, she's held down the fort with all three children (including a 6 month old!!!). She is my inspiration. Love you babe! Well, that's all the time I can afford now as I have to prepare for the Toronto Fan Expo where I will be spending much of next week with my friend Keith Grachow! If you're in the area come seek us out! Oh, and I do TWITTER now. Hey everyone! 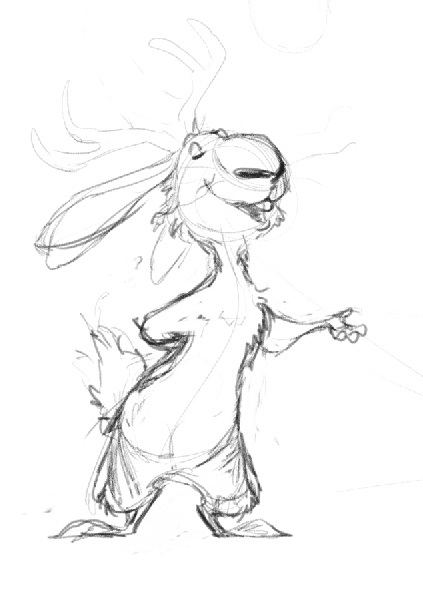 I was scritch scratchin' the other two mornings doing some character dev for a new idea I'm kicking around and decided to do another screen recording of the process. Forgot to get the drawing part again. Anyway, here's the sketch and video. 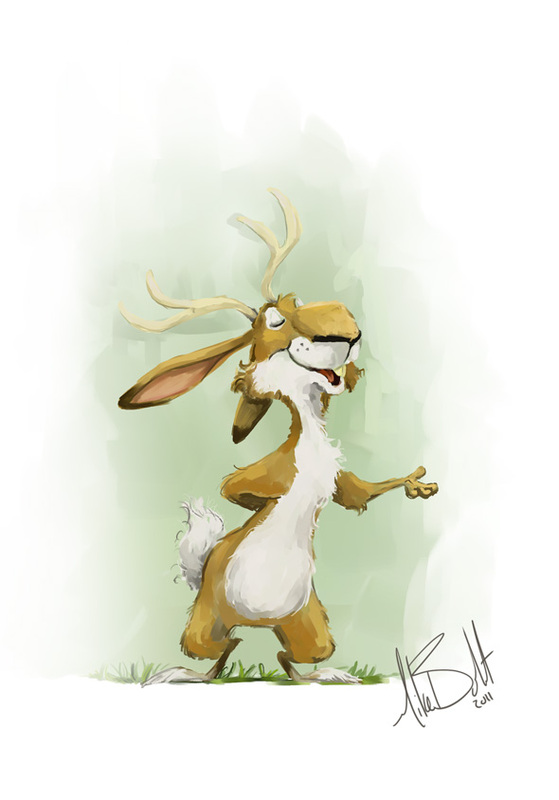 The whole thing took around 40 minutes and was done in Corel Painter 11. 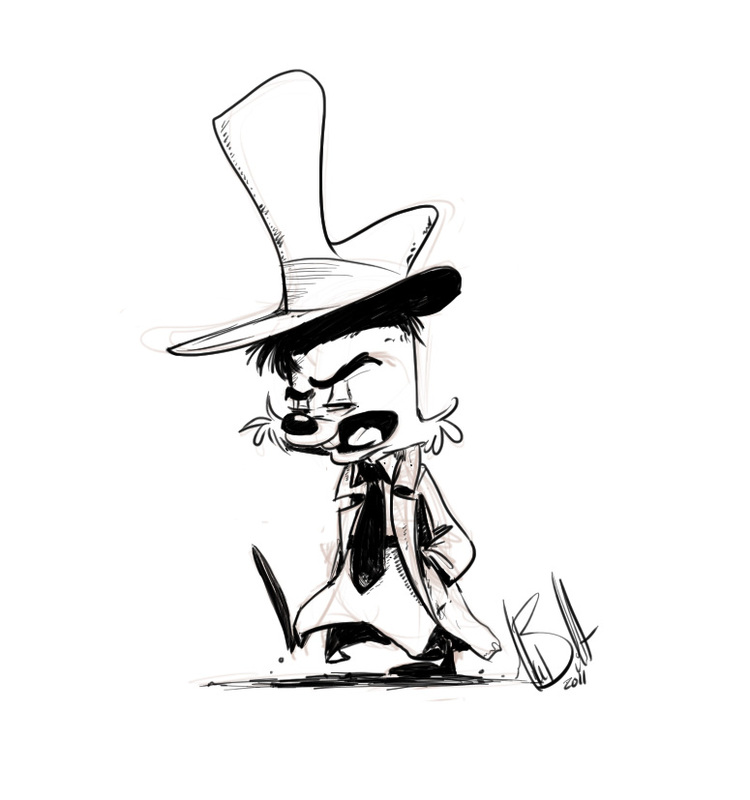 Finally, I'll toss in this warm up sketch of chuck I did the other day.